An exciting opportunity exists for a commercial manager with a civils background to join the Salix team in the continuing growth of this successful innovative business. Wetlands are an incredibly valuable environment, both to nature and wider society; BioHaven can offer all of the ecosystem services of a healthy functioning wetland but can be placed in an area where it would be impossible to put a constructed or conventional wetland. Flood Embankment Protection Catterall, Garstang – Salix win the contract! Salix are providing a supply and installation package for framework contractor Cheetham Hill as part of the Environment Agency Flood Protection Works. Photo shows our in- house specialist labour installing Coir Rolls, Rock Rolls and VMax C350 to protect newly re-graded flood banks. Salix Technical Director David Holland was lucky enough to get a last minute ticket for Super Saturday and Team GB’s amazing three Athletic medals. The visit also gave David the opportunity to check out the progress of the 2 hectares of new wetland habitat that have been created. “Going for Green – Britain’s 2012 Dream” tells the amazing story of the 2012 Olympic Park build. 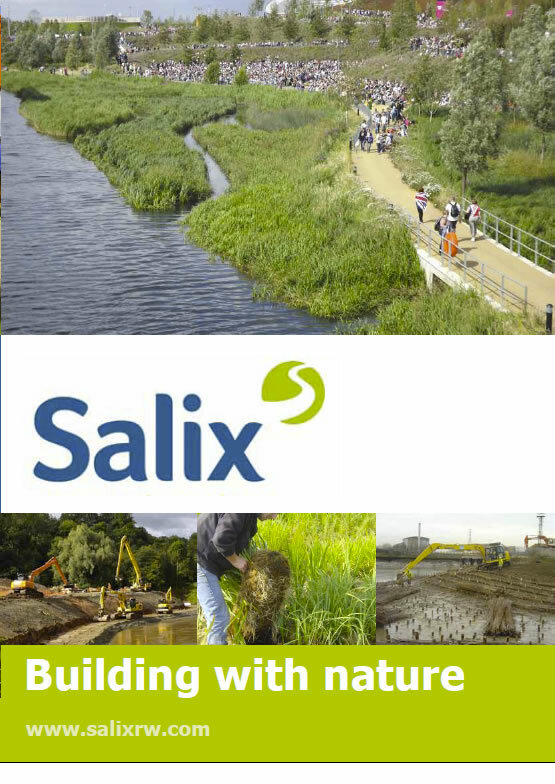 Find out about the construction of the Olympic Park on this video and how Salix was involved. Movember the tache strikes back As “Movember” drew to a close, this is what our hairy duo were sporting! We think Richard’s tache (left of photo) has the edge on David’s lip caterpillar – bring on the next Movember to see if the boys can better this years growth! Movember-David and Rich grow one for charity!